Having a Jacuzzi or a spa in your own home is considered a luxury, and the type of luxury an average person can only dream of. But with Coleman Lay-Z spa inflatable hot tub, this dream may not be out of reach. Lay Z Spa is one of the best inflatable hot tubs in our buying guide. While it may look like a kiddie pool to some due to its inflatable walls, this is a high-end, high-quality piece of equipment that is meant to bring relaxation and healing in equal measure. So, what makes Coleman Lay-Z Spa special? There are many things that put this hot tub above others in terms of quality, simplicity, build and utility. 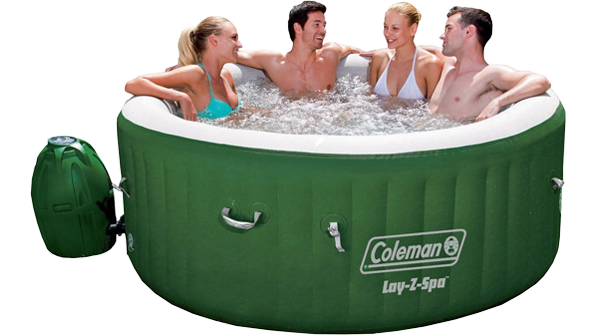 Coleman is a very renowned manufacturer of inflatable hot tubs, all of which are nearly matchless. That being said, Coleman enjoys great trust with the customers, making them boost their standards to fulfill the wishes of their customers. And, indeed, Coleman do their best to reach new heights with their products, creating ever better and sturdier inflatable tubs. Don’t forget to check out hot tubs made by Intex. One of the greatest traits of this Coleman hot tub is its durability, which is exactly what I just wrote about. 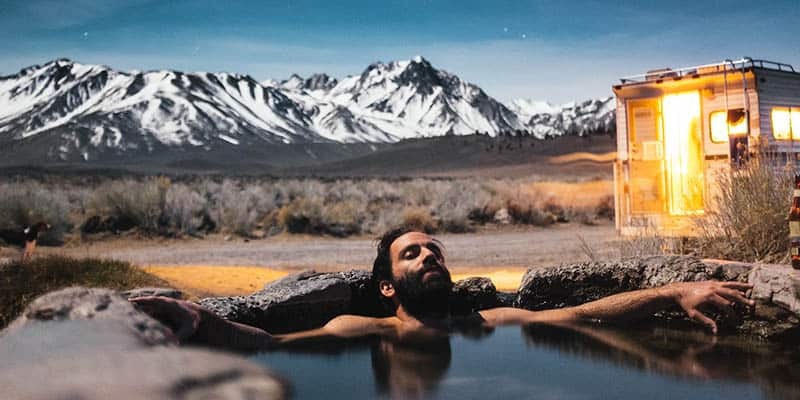 Coleman searched far and wide to find the best possible material out of which to make their hot tub, so that it may be resistant to puncture and damage of all kinds. And if you think about it, there are many factors that can damage your inflatable hot tub. Pets are one of the problems, as even a dog with its dull claws can rake into the material and cause a rupture. There is also regular wear and tear of the material, and there are of course sharp objects that are lying around every house. That is why Coleman decided to go with something called the TriTech material. This TriTech material is very puncture-resistant but soft and malleable. The material actually has three plies that work together as a unit to deliver maximum protection, while retaining stretchiness so that the tub doesn’t burst when being inflated. The layers form a sort of a “sandwich”, where a polyester mesh is encased by two layers of PVC. The polyester mesh here acts as a structural support, while the PVC make the walls. Another thing about the Lay Z spa that I find pretty impressive that you can actually sit on the side of the tub. Most tub manufacturers do not recommend sitting on the side, as it may cave and burst. However, Lay Z features something they call I-beam construction, in which the material acts as pillars strong enough to withstand your weight. As for the inside of the tub, it’s simply made for maximum comfort. The inside walls, thanks to their softness, facilitate the support the massaging process even further, working together with jets to deliver maximum relaxation. The floor is cushioned, providing excellent comfort when sitting and standing. The floor is also made to retain heat, as most hot tubs lose heat mostly through the bottom. Oh, yes, and in case you do rupture the tub, the box comes with a heavy-duty patch so you can fix the tub yourself. You will also receive a cover for the tub that can be strapped down, which also reduces heat loss. Now, anyone who even remotely did some research on tubs knows that one of the most important components of the spa are jets. Coleman Lay Z Spa hot tub features 120 jets, strategically placed around the perimeter. This improves the effectiveness of the spa as a whole, as it delivers the streams exactly where they’re needed for best effect. Also, the sheer number of jets signifies a high-quality spa, as all of those jets spewing warm water will certainly be beneficial if you have problems with your muscles or bones, delivering respite to ailing and/or tired. Another important component is, of course, the heating system. It is here that Lay-Z spa is the most impressive. Lay-Z’s heating system is very efficient and intuitive, all the while trying not to rack up a gargantuan electricity bill. The system is controlled by a central control hub in the form of a panel. The controls on the panel are very simple, allowing you to set the temperature to the desired level, as well as allowing some advanced functions. These functions include something called rapid heating, where the heating system will be pushed to the max in order to shorten heating time, and a timer that lets you set up a how long do you want the machine to run. The whole thing is very sturdy, of course, and can is built to last. However, even though the heating system is very effective at heating the water, it is still a very large quantity of water that needs to be heated. The tub holds 254 gallons of water, and, you understand, this is quite the volume. At a rate of about 3 degrees per hour, it takes about 20 to 24 hours for the water to heat up, to a maximum temperature of 104 F.
Finally, there can be no hot tub without filters that will keep the water clean. This an important factor, as the water you will be spending your time in has to be clean in order to avoid any complications. Lay-Z uses high-efficiency filters, two apiece, that ensure no bacteria or fungi develop in the water. You also have a chemical floater. It is recommended to use bromides with the floater, but people have been using chlorides without any difference in water quality or the efficiency of the floater. All in all, this is one mean inflatable spa. It is of incredibly high quality and is very beneficial to those with ailing or tired bones and muscles. At a capacity of 4-6 adults, Coleman’s inflatable Lay-Z spa is a perfect way for the family to relax and unwind in a Jacuzzi of their own, and at a pretty nominal price. Can you please tell me if this hot tub can plug into a 110 v ? Yes, it can. Actually, all hot tubs on this site work with the 110v electrical socket. Need a replacement inflatable cover insert. Where can I get one? It shouldn’t be difficult to patch if there’s a small air leak. Did you ever find one? We are needing one too. I have read that air jets can reduce water temperature. Is this being compensated by a a separate air heater? Hi Brian, unfortunately, it’s not compensated by any air heater. All inflatable hot tubs only have water heating ;). I need a new cover how do I get one? How cold can it get before you have to take it down? I need a replacement inflatable cover insert? Any ideas? have had mine for a year and husband stuck his hand in to check temperature and got shocked! This has happened twice. We sent the first one back because of this and now it is happening again. Good thing we didn’t step in! Hey Donna! I suggest you always use a GFCI breaker for your hot tub (and also any appliances used in the bathroom) for your safety. I haven’t heard of this happening ever before, please let us know more details. Was the problem found at the heater unit?